Opening Day May 10th. The Range opens April 19th. Take an overhead video tour of every hole of the Arnold Palmer designed, Whistler Golf Club. "Playable, fun, walk-able, friendly staff, amazing greens, incredible views..."
Come experience the Arnold Palmer designed, Whistler Golf Club. Come join Director of Instruction Duncan Savage and his team of C.P.G.A. Teaching professionals at Whistler's best practice facility. Duncan has a range of instructional programs for adults and juniors of all ages. I really enjoyed playing this course. It is located in the Whistler Village so it is very convenient. The staff were extremely friendly and helpful. The views on the course are beautiful and the course has tall trees and lush greenery. The greens were in very good shape. The value for the cost of the green fees was great. The facilities were nice. Overall, it was a wonderful experience. The best rates for golf at the Whistler Golf Club can only be found here, guaranteed. 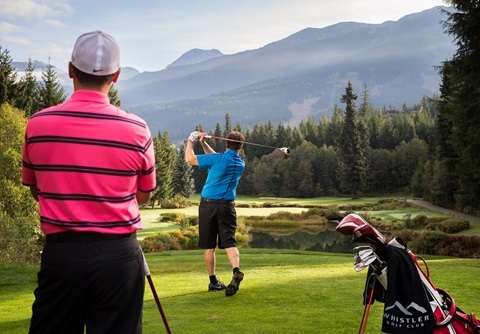 Sign up for specials to receive ENews and offers from the Whistler Golf Club. Do you have a group of 12 or more? The organizer stays and plays for free so call us today. We specialize in group outings of all sizes.